Last weekend the Choir travelled to Northern Ireland to participate in the Bangor International Choral Festival. The Festival had a very convivial and welcoming atmosphere; it was clear that the organising committee and volunteers put in a huge amount of work to make the Festival a success. We entered a number of classes and were delighted to win the Folk song class! The adjudicator praised our legato line and said that we really captured the sense of each piece. There was a wide range of talent, including some excellent choirs – all the first places were well-deserved. The impressive Trelawynd Male Voice Choir left with a clutch of prizes, including the Tipperary Cut Glass Vase from Tourism Ireland for the best non-Irish choir of the 2019 competition. The superb Miskelly Chorale who won the Ladies Choir section also won the Sacred Music & Special Awards class- their rendition of ‘Love Divine’ by Howard Goodall was truly lovely. Actually, we were delighted that Howard Goodall remembered us and very kindly sent us good luck wishes via Twitter as the Festival began. We included Howard’s The Lord is My Shepherd in our repertoire, but the Miskelly Chorale were clear winners on the day! We are lucky that, because our Musical Director, Angela Rowley, is a highly experienced and qualified BIFF adjudicator herself, she was able to explain to us the adjudicators’ feedback in context. In Bangor, our most prized positive feedback (there was lots of it) came from other choirs and members of the audience – the local MP had a tear in her eye when we sang The Rose A capella (Amanda McBroome, arranged by Angela Rowley & John Stott), prompting for her some treasured memories. Typically, Angela went ‘above and beyond’ in organising the trip (which included trips to Titanic and the Giant’s Causeway) and directing us with great skill through all our carefully memorised pieces. John worked really hard, as ever, providing top-class accompaniment. And our lovely Choir all had a fabulous time together, making the most of chances to spend time together and enjoy the experience in our own way. Those members who were unable to travel to NI were kept ‘in the loop’ by messages and pictures via WhatsApp, Facebook and Twitter. This really is wonderful choir! 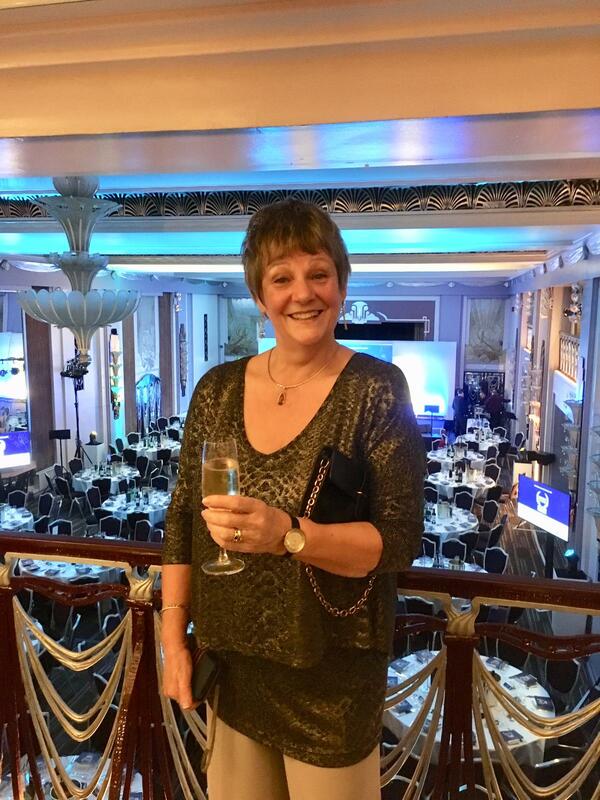 On the 6th of March, two of our sopranos, Sue Samuel and Leslie Robinson, were delighted to be able to accompany our wonderful MD Angela Rowley to the Rhinegold and Classic FM annual Music Teacher of the Year Awards for Excellence at the Sheraton Park Hotel in London. They wanted to represent us at the event because Angela made it to an exclusive shortlist for a distinguished National Award, the Francesca Hanley inspirational award! The idea for the nomination came about when Leslie attended one of Angela’s Christmas solo workshops. The day had been fantastic; lots of learning, laughs and motivation. Then after a super concert Angela invited the singers back to her house for supper. Not content with having catered to their singing needs, Angela was hard at it in the kitchen cooking up supper! Surely there could not be a more caring and hard-working music teacher? Leslie put the idea to the choir and was promptly inundated with words of encouragement and a general feeling that we really must nominate Angela for this award. We invited members to submit their stories of how Angela had supported them; the stories came in thick and fast! They were not just related to music and singing either. There were plenty of incidents where Angela had gone ‘above and beyond’ providing comfort and encouragement to choir members in times of personal difficulty. It was hard to condense 3000 words down to 300 but we managed it just about! Angela Rowley: founder/ MD “Eccles Community Choir” (ages 30-90!) and “Harmony ’96”, private tutor, festival adjudicator and facilitator of self-belief through voice! So on the 6th of March they set off down to London and a fantastic, glamour-filled, champagne-popping evening was had by all. 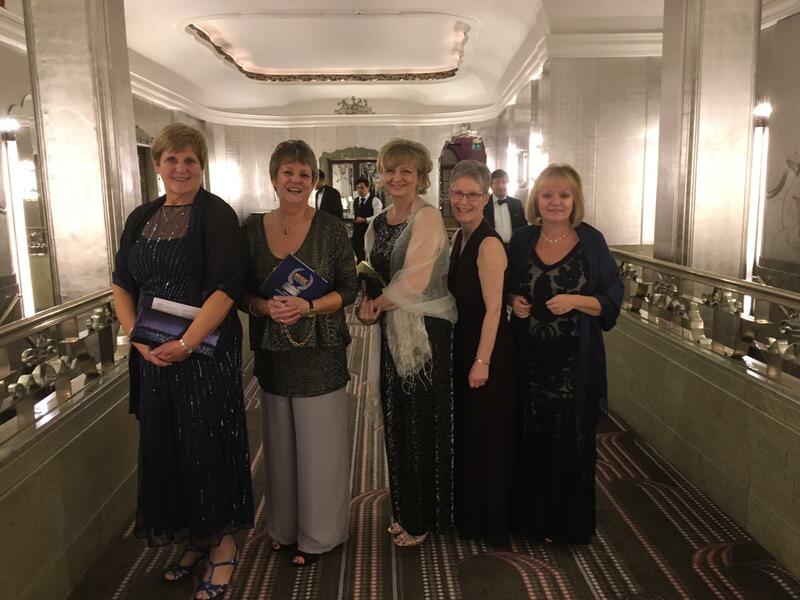 Friends Avril and Catherine also joined Angela, Leslie and Sue for the glittering evening celebrations, where the top award was presented by the prestigious pianist, Lang Lang. Although Angela didn’t win she was in a shortlist of just 5 teachers from across the UK. A remarkable achievement and we are all very proud of her. She is indeed our inspiration! The five lovely ladies are pictured below. More praise was heaped on Angela on Saturday 9th March, when we took part in the Salford MAPAS vocal and Choral festival. Adjudicator Debbie Prince provided feedback on our performance which recognised Angela’s skilled management of the choir; she really appreciated how skillfully Angela shapes the sound we make. 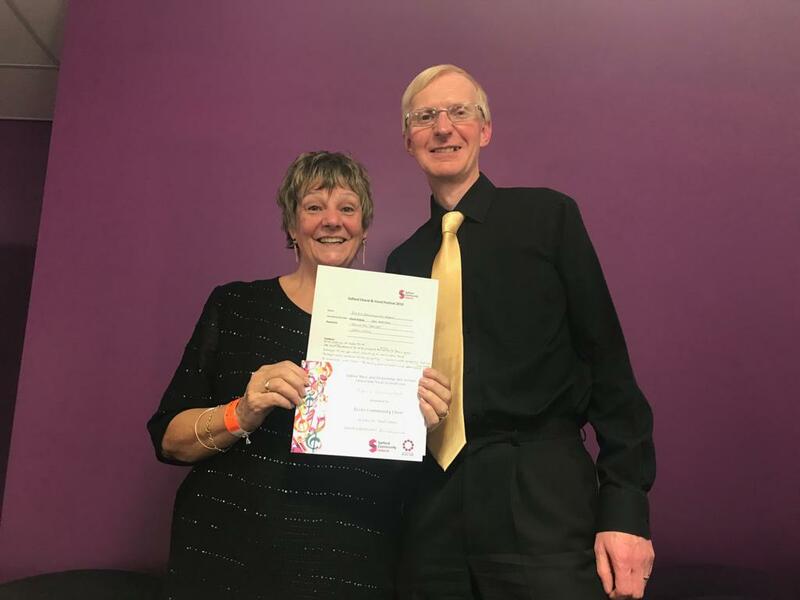 Thanks to Angela (and of course also thanks to John’s excellent accompaniment) we were awarded a ‘Highly Commended’ rating for our performance in the adult choir section! Angela and John are pictured below receiving our certificate. Happy Days! We are giving a concert at St Michael’s, Bramhall ( http://bramhall.church/contact/ ) on 29th March,starting at 7.30pm. This will be the third year in a row that we have been invited to perform St Michael’s. Once again the concert will be a fundraiser for the very worthy cause, much-needed youth services at The Mill (http://www.themillbramhall.com/). A little trip outside our usual Eccles locality, St Michael’s is a lovely place for a concert – warm. comfortable and welcoming; also an excellent acoustic space. It’s our privilege and pleasure to perform there, and all for a very good cause. It would be great if you are able to come along and enjoy the entertainment; admission is £7.